Below is an overview of herbicide injury scenarios presented at the SouthWest Crop Diagnostic Days . 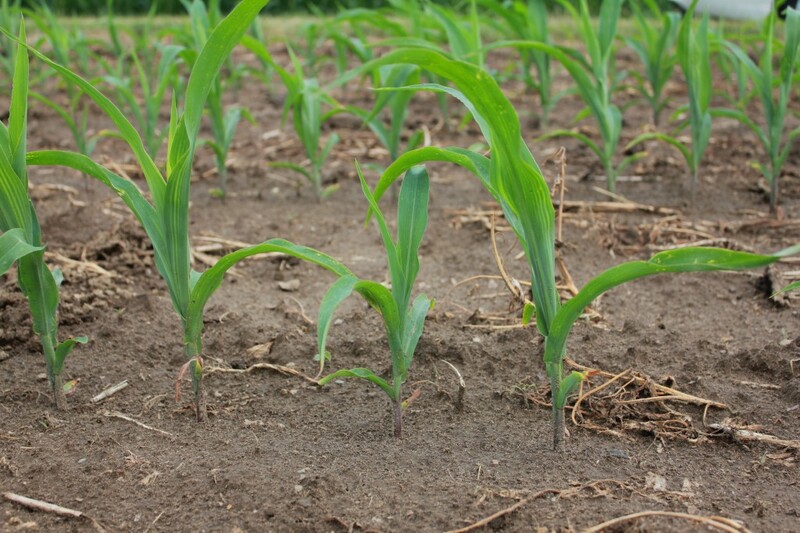 Scenario 1: A field of corn has been replanted due to a poor stand. After planting the producer has decided to remove the existing stand as it is effectively a weed to the new crop. Unfortunately weather delayed the graminicide application and it was applied just prior to the replanted corn spiking through. 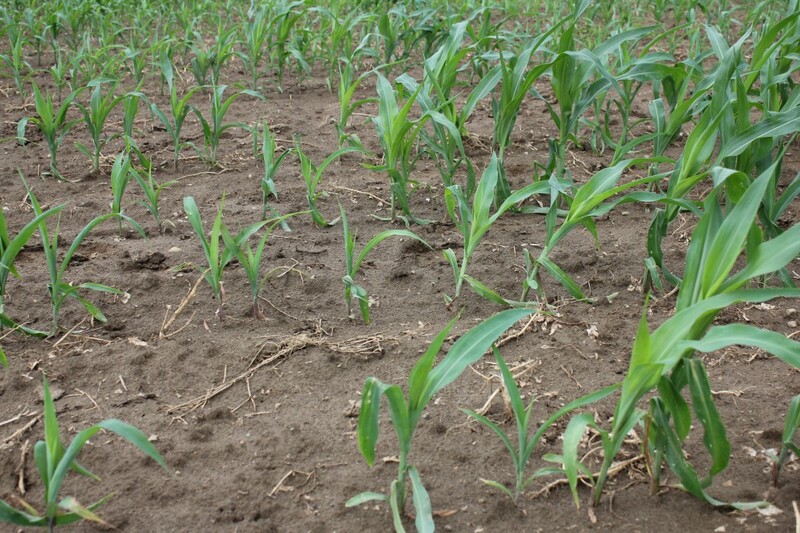 To compound this issue, the herbicide was mistakenly applied at four times the volunteer corn rate. 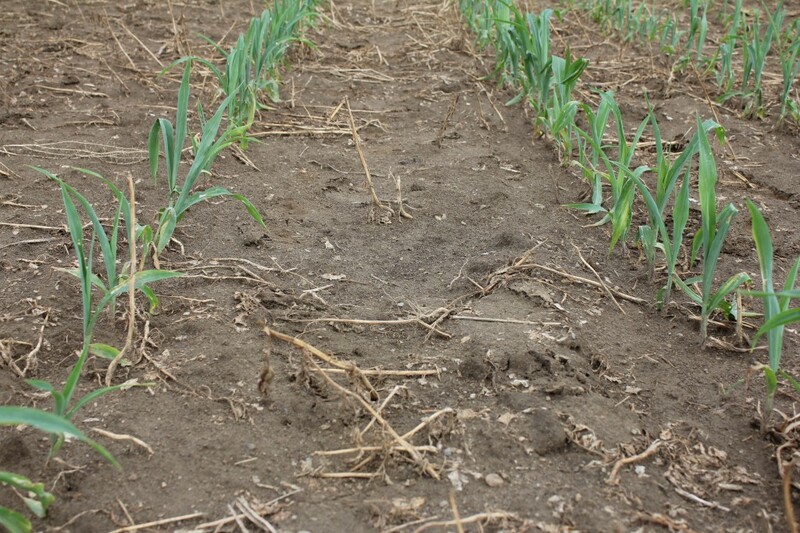 The use of applying a graminicide to remove a poor stand of corn has been researched in Ontario and more information can be found in the following article. when fluazifop (Venture) is applied at a1X rate and prior to replanting, the risk of injury is dramatically less. 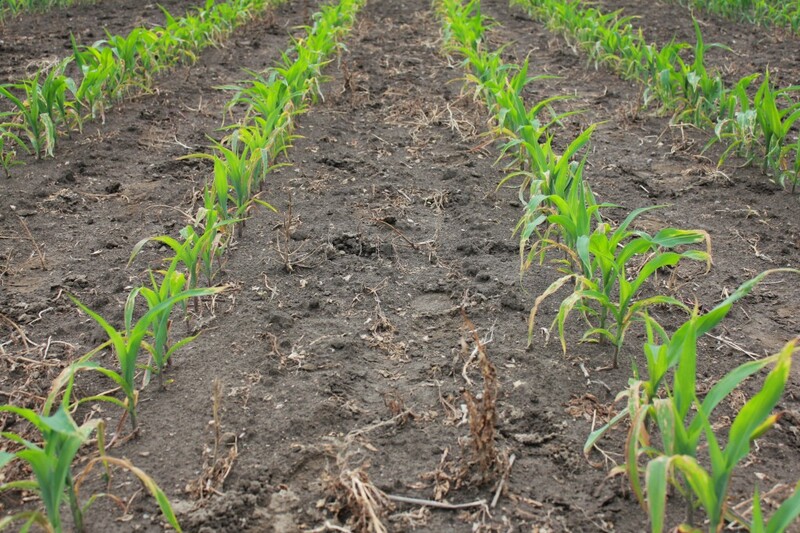 Fluazifop (Venture) applied at a 4X rate, just prior to corn emergence. Note the stunted stand. Another part of the demonstration plot that received a 4X rate of fluazifop, applied post replanting. Note the variability in stand at this rate. Scenario 2: A producer has a horrible infestation of field horsetail and decides to tank-mix MCPA with glyphosate to improve control. The results are not as desired. 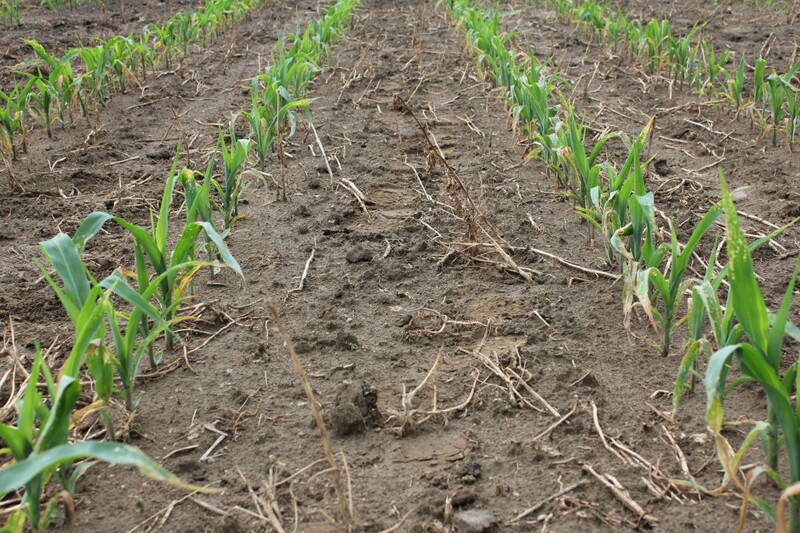 An application of MCPA at the overlap rate, has caused the corn to turn brittle and fall over. 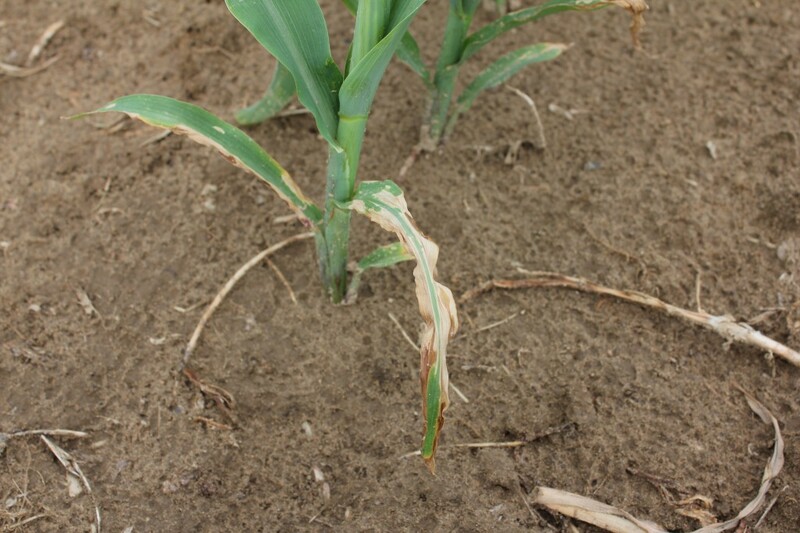 This corn stand turned brittle after an application of MCPA (overlap rate) resulting in about 40% of the stand lodging. 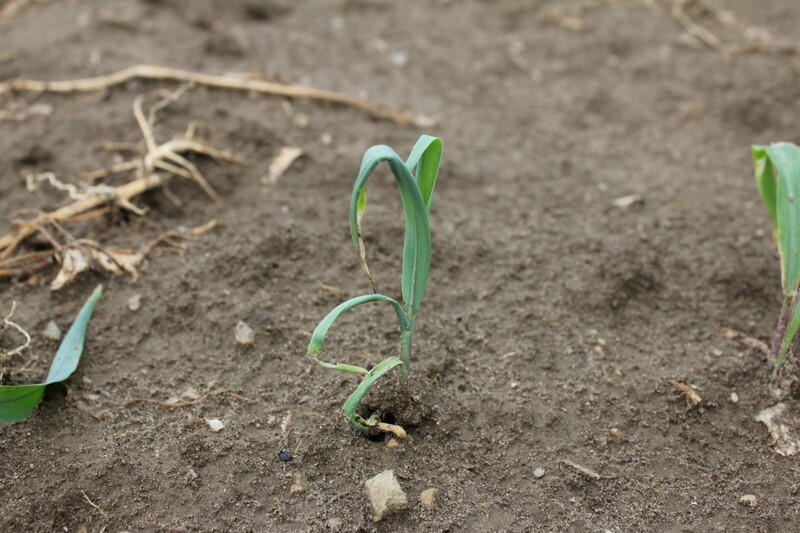 Although MCPA is registered for use on field corn in Ontario, it was done so in an era where there were few options. 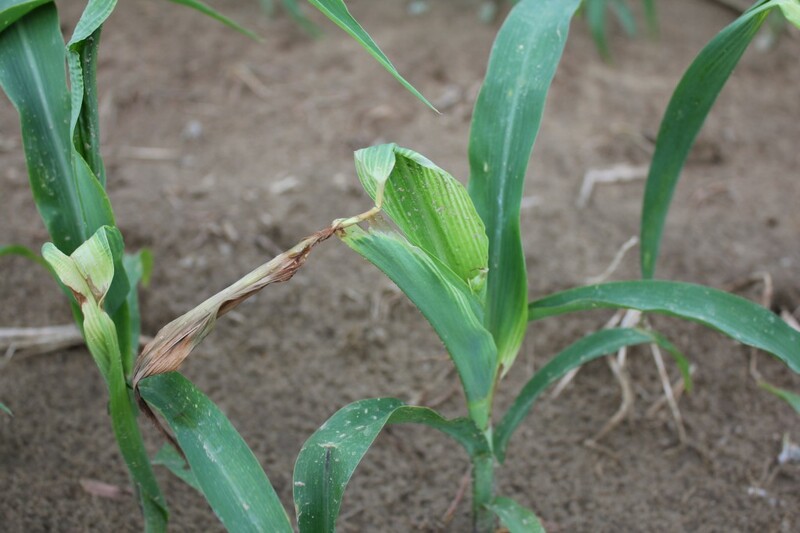 The experience in Ontario is that sometimes one can apply MCPA to corn and see good crop safety, in other instances, particularly when the crop is under stress, the injury can be dramatic. Injury may be enhanced when MCPA is tank-mixed with glyphosate. 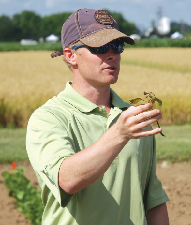 Dr. Peter Sikkema (University of Guelph) is currently studying the interactions between MCPA + glyphosate applications and corn injury and yield. 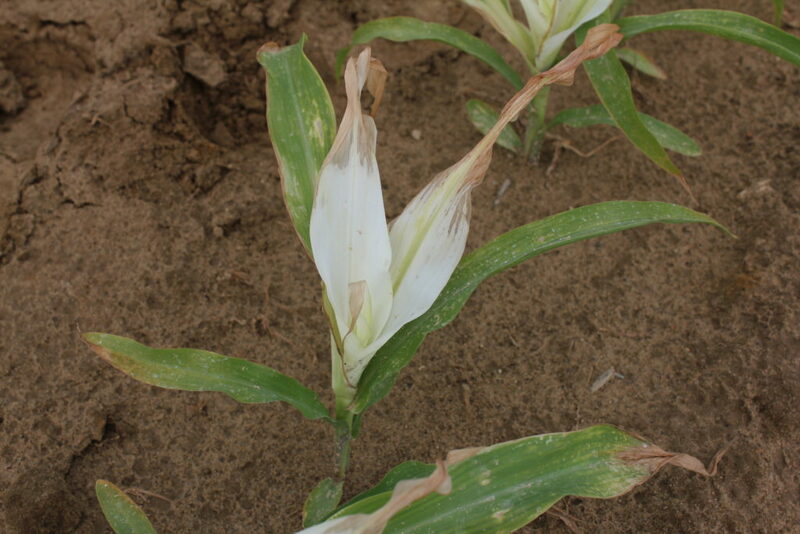 Scenario 3: The picture below demonstrates crop injury caused tank-contamination with a protox inhibiting herbicide (group 14), in this particular example Reflex (fomesafen). The photos below represents transient injury from a 10% of labelled rate. This typically has no impact on crop yield. Transient injury caused by a tank contamination of Reflex (fomesafen) at 10% of the labelled rate. Another example of transient injury caused by a tank contamination of Reflex (fomesafen) at 10% of the labelled rate. Scenario 4: Below is an example of tank contamination caused by two different herbicides from the same general family, but with very different results. 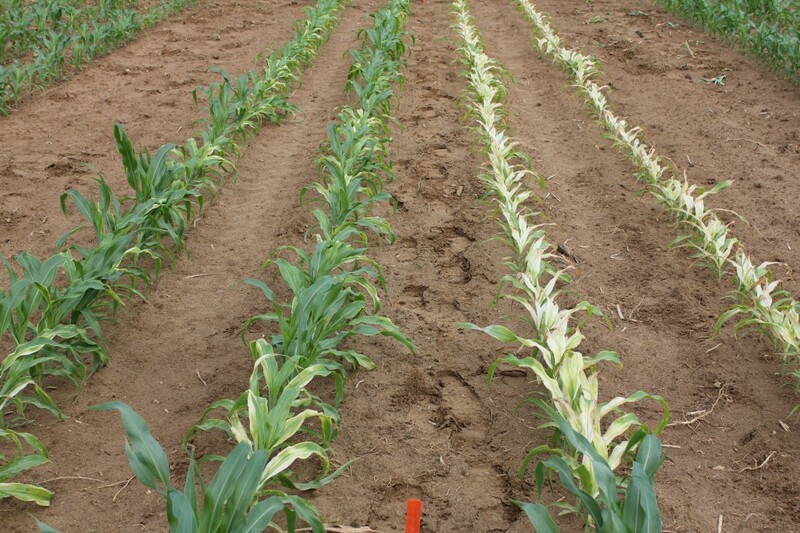 Corn injury caused by tank-contamination of Achieve (tralkoxydim) on the left compared to Puma (fenoxaprop) on the right. 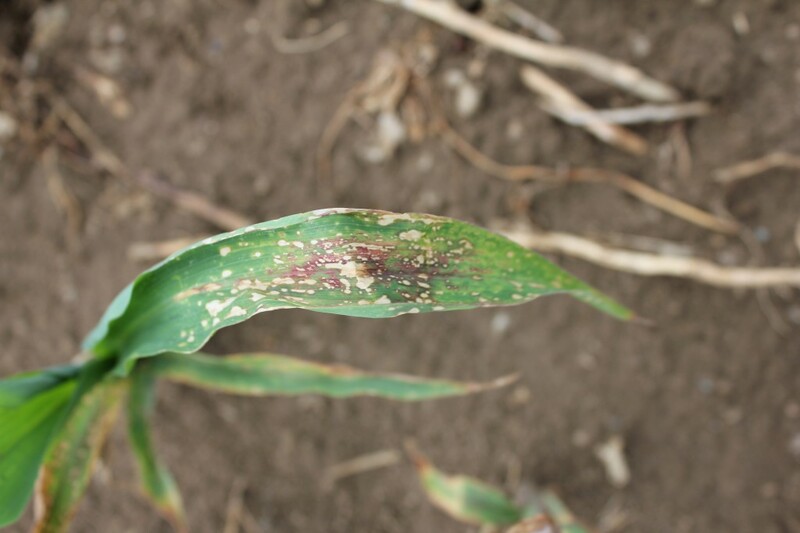 Injury caused to corn by contamination with Achieve (tralkoxydim) at 10% of labelled rate. 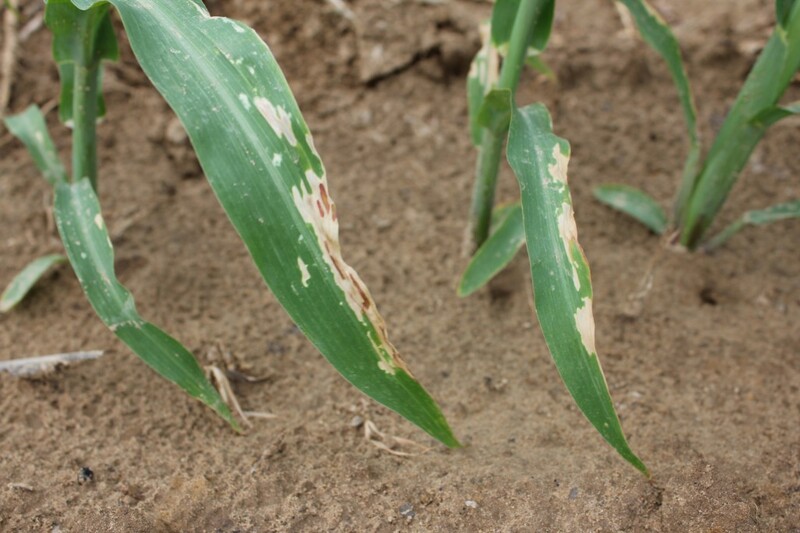 Another example of injury caused to corn by contamination with Achieve (tralkoxydim) at 10% of labelled rate. Both Puma (fenoxaprop) and Achieve (tralkoxydim) are grass herbicides known as graminicides (WSSA group 1). However, injury from an unintended tank contamination is typically greater with Achieve than Puma. This maybe due to Puma containing a safener. Both products however, at low doses can have a significantly negative impact on yield. 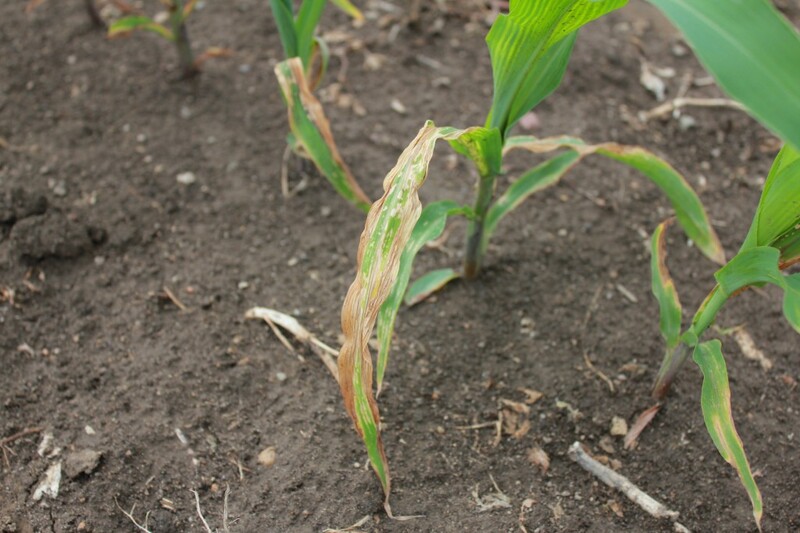 Tank contamination with Puma at 10% of the labelled rate causing injury to corn. 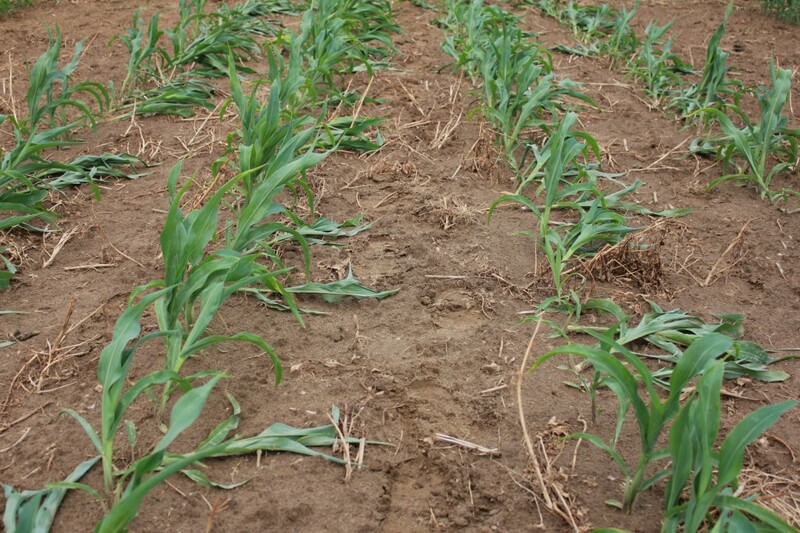 Scenario 5: Below is an example of crop injury caused by an accidental application of a cereal herbicide, Infinity (pyrasolufotole/bromoxynil). 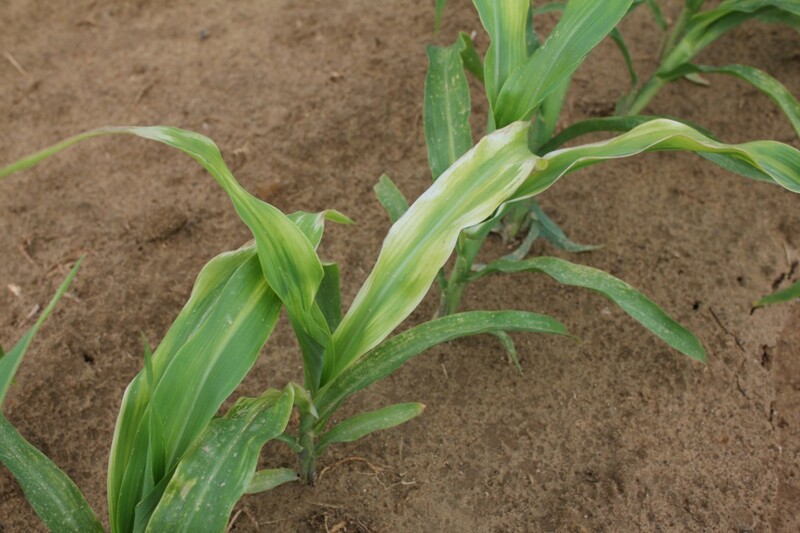 The injury 3-5 days after application is often a bright bleaching colour (see scenario 7) typically on the most prominent leaves at application (in this case the 3rd and 4th) then injury then turns to yellowing (chlorosis) followed by browning (necrosis). 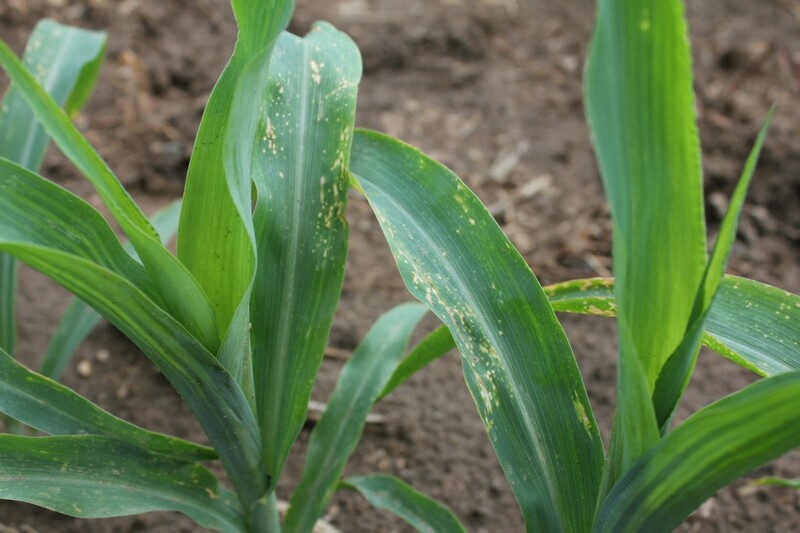 The bromoxynil portion can also cause the browing of leaf tissue, particularly if applied prior to the 4 leaf stage. The injury caused by Infinity does not necessarily result in yield loss, but the injury caused is typically unacceptable. Injury caused when Infinity is applied to corn. Note the injury is limited to the leafs most prominent at application. Scenario 6: The picture below demonstrates crop injury caused by an accidental application of Flexstar (glyphosate + fomesafen) a herbicide for glyphosate tolerant soybean. The severity of injury with fomesafen can vary significantly. Below is an example of low to moderate injury, it can be much worse. 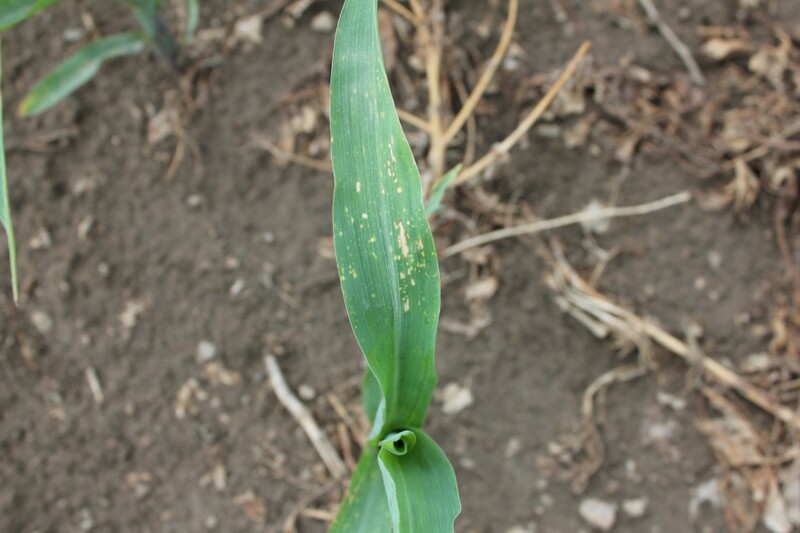 The leaves most prominent at application (3 and 4) are showing the greatest amount of injury following an accidental application of Flexstar (glyphosate + fomesafen). 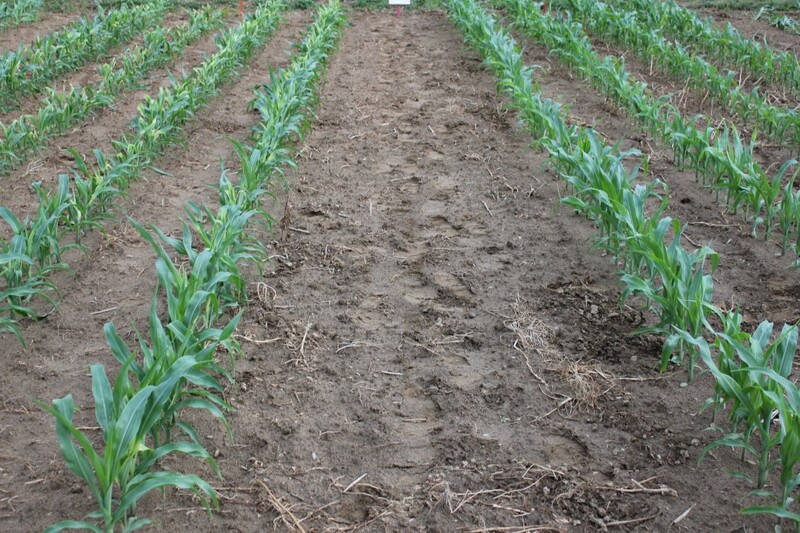 Scenario 7: The three photos below illustrate the difference in corn crop safety to isoxaflutole/atrazine applied post emergence at the overlap rate (2X) with a crop safener (as found in Converge XT) compared to the old Converge Pro that did not contain the crop safener and hence could only be applied pre crop emergence. These photos certainly demonstrate the value of the crop safener to improve crop safety. Scenario 8: Another tank contamination scenario. Below represents a 10% rate of Guardian Plus, which contains glyphosate, chlorimuron and flumioxazin. 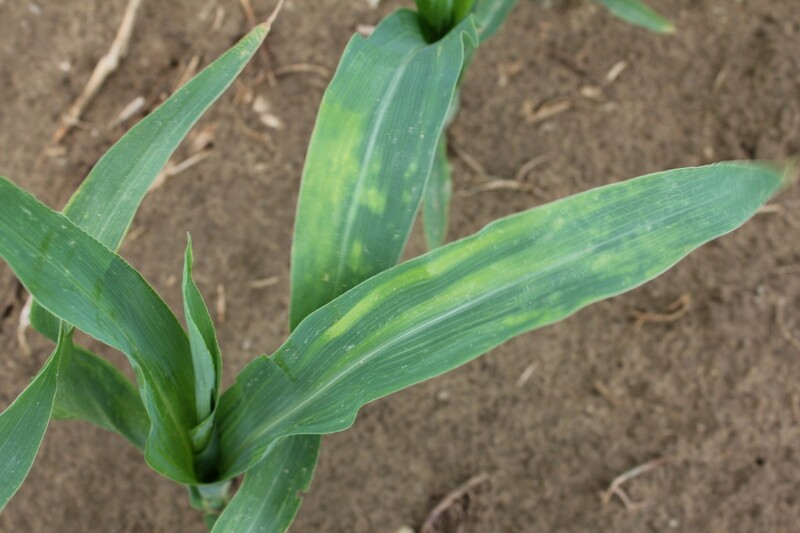 The chlorimuron portion will cause stunting and reddening of leaf tissue. The flumioxazin portion will cause the leaf necrosis (brown speckling). A wide shot of Guardian Plus injury caused by tank contamination (10% of labelled rate). Scenario 9: Below is an example of injury caused by inappropriate application timing. 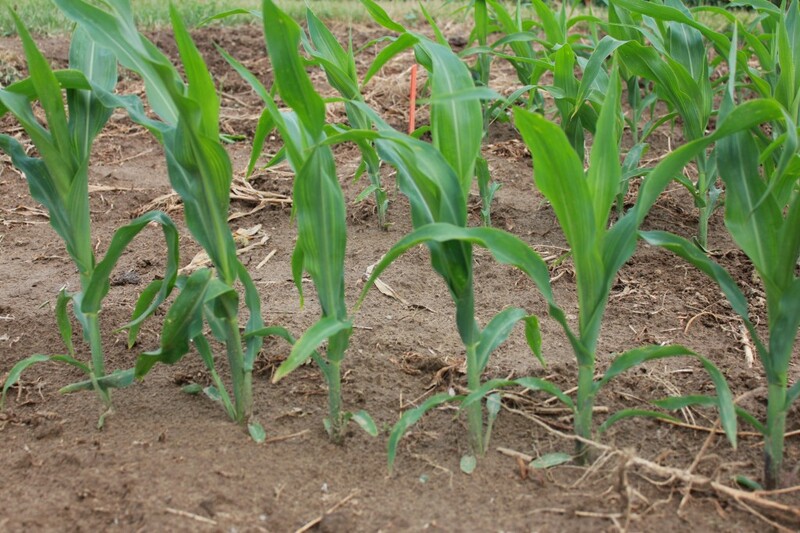 Integrity (saflufenacil/dimethenamid-p) was applied when corn was at the 2-3 leaf stage. Integrity can only be applied prior to corn emergence. Retarded growth caused by a post emergent application of Integrity at the 2-3 leaf stage. 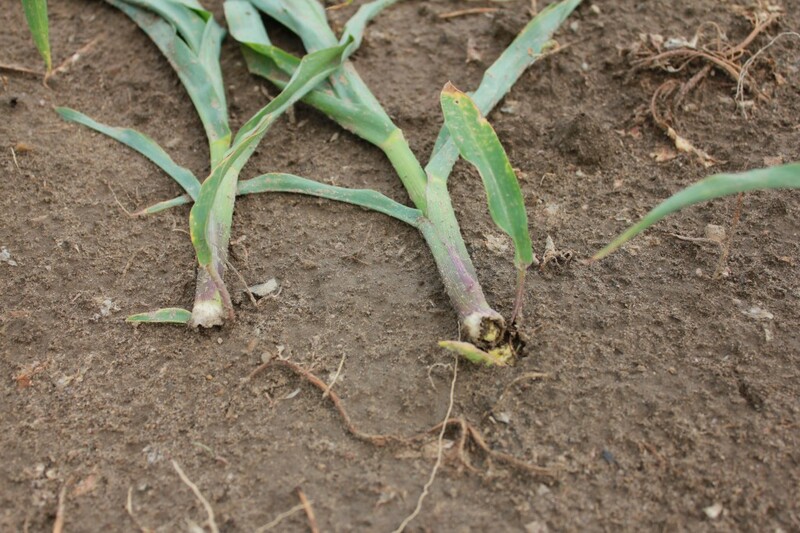 The saflufenacil portion had burned off the emerged leaves, but since the growing point was below the ground, the corn was able to regrow. 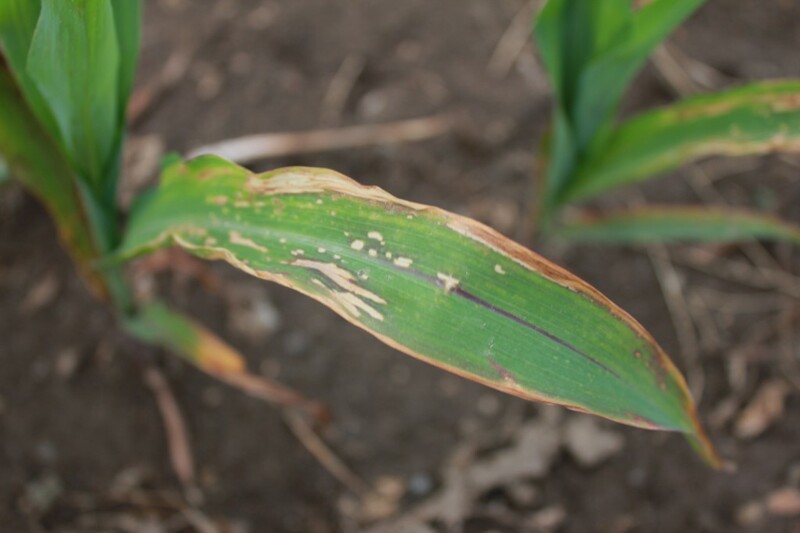 A by-product of leaf burn caused by saflufenacil, is that the new growth gets “caught up” in the necrotic leaf tissue causing distorted growth. Scenario 10: Below is an example of an experimental herbicide, not yet registered in Canada that will likely be intended only for use as a pre emergent soybean herbicide. 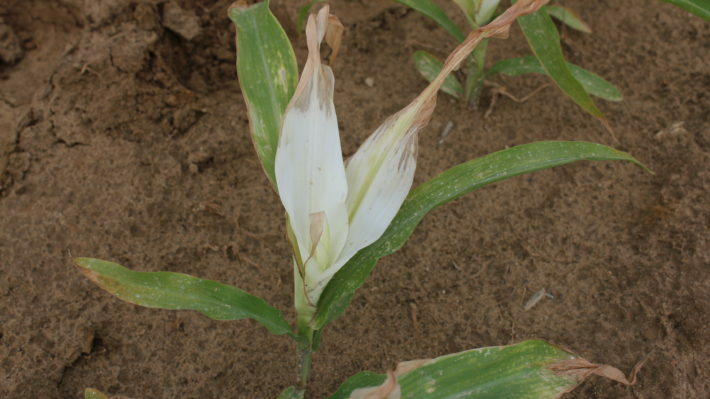 The, broadleaf component of this herbicide, flumioxazin, is registered in the United States for use on corn provided it is applied several days prior to planting. 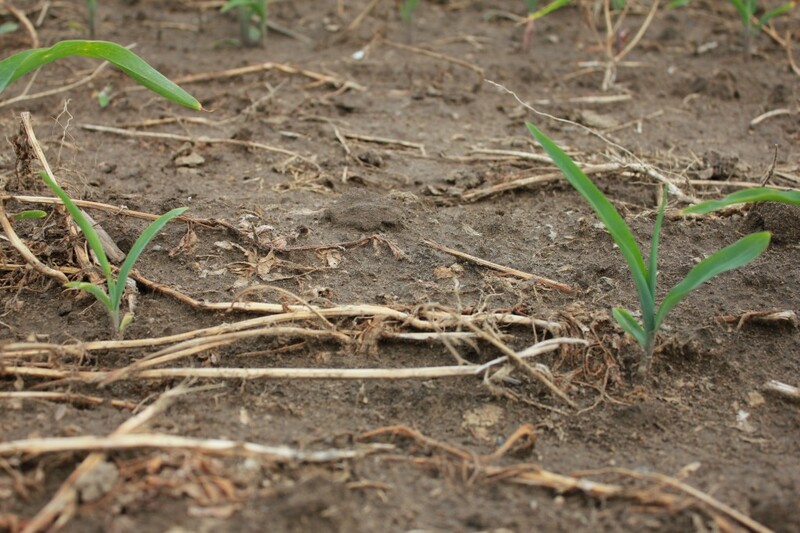 In this particular scenario, the herbicide was applied prior to emergence but 3 days after planting. 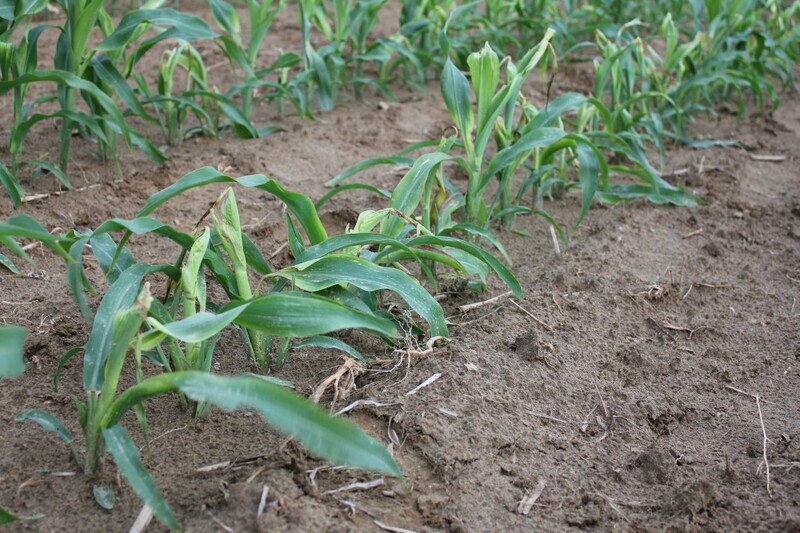 A stunted uneven corn stand caused by flumioxazin being applied post planting and shortly before crop emergence. 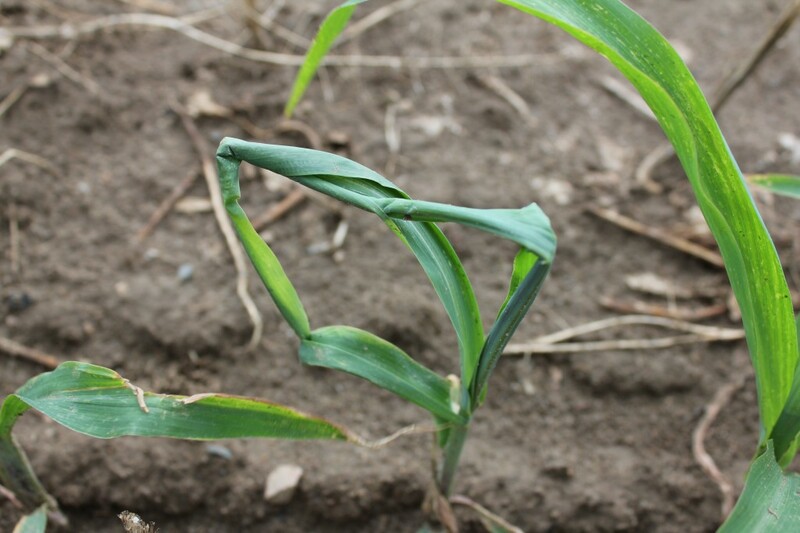 Severe leaf distortion caused by an application of flumioxazin just prior to corn emergence.